Visual comparison of finite element analyses of the skull of Carollia perspicillata (left) and the base engineering model of the same bat (right). STONY BROOK, NY, January 28, 2014 – Mechanical advantage—the efficiency in transmitting force—can be decisive, whether it be through an automated harvester in agriculture, a six-foot-six swimmer, or a bat with a short face that gives it the bite force to penetrate hard figs. It’s bat evolution that interests Stony Brook University Assistant Professor Liliana M. Dávalos, who joined forces with Dr. Elizabeth Dumont, and a mechanical engineer, Dr. Ian Grosse (both of the University of Massachusetts at Amherst), in a recently published paper in Evolution — Selection For Mechanical Advantage Underlies Multiple Cranial Optima In New World Leaf-Nosed Bats — that lays out the team’s findings relating mechanical advantage to natural selection. The researchers also unveiled an engineering model of a skull that can be computationally manipulated to morph into the shape of any New World Leaf-nosed bat species, to help uncover evidence for selection in long-extinct organisms. 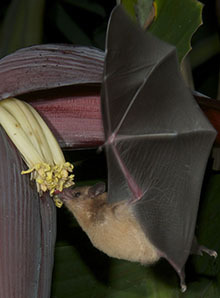 Glossophaga soricina, a nectar bat, feeding on the flowers of a banana plant. 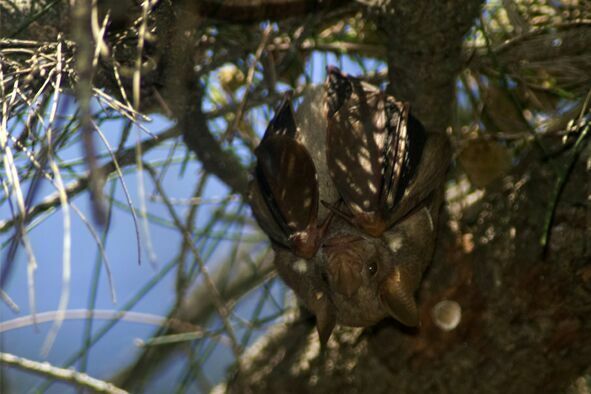 Nectar feeding bats comprised one of three evolutionary optima for mechanical advantage among New World Leaf-nosed bats. 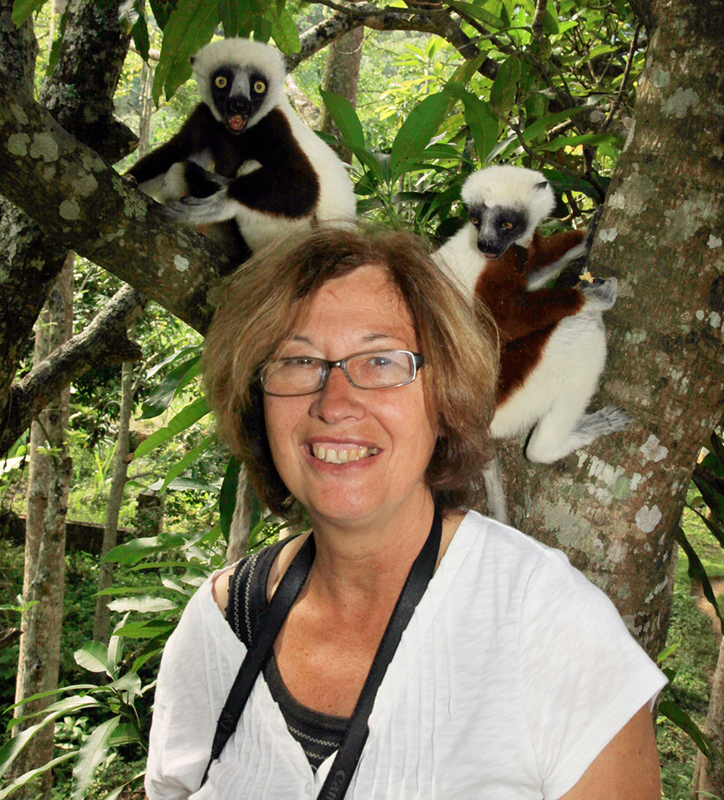 Photo credit: Dr. Beth Clare, Queen Mary University. The research team investigated adaptive radiation—the explosive evolution of species into new ecological niches, powered by natural selection—of New World Leaf-nosed bats. These bats, of which there are almost 200 species, eat a variety of foods, including insects, frogs, lizards, fruit, nectar, and even blood. Their skulls mirror the variety of their diets—bats with long and narrow snouts eat nectar; Short-faced bats have short, wide palates and eat hard fruits; snouts of species that eat other foods are intermediate in shape. The team’s approach to identifying natural selection for mechanical function combined both evolutionary and engineering analyses. 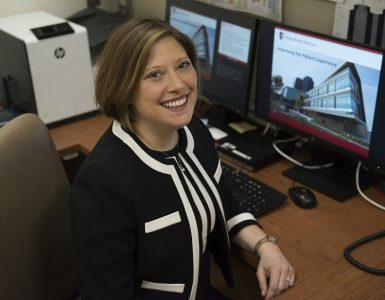 Dr. Dávalos and her Stony Brook University students generated the evolutionary hypotheses, evolutionary trees, and tests of selection reported in the study; Drs. Dumont and Grosse developed the engineering model. The interdisciplinary effort involved evolutionary biology, biomechanics, and mechanical engineering. The research was funded in part by National Science Foundation grants. The researchers first built the three-dimensional, finite element model to simulate bat skulls with myriad combinations of snout length and width. Visual comparison of the shapes of micro-CT scans (light blue) and engineering (dark blue) models for the base model of the omnivorous bat Carollia perspicillata (B), and the morphed models for the nectar-feeding Glossophaga soricina (A) and the specialized fig-eating Short-faced bat Centurio senex (C). They then analyzed the models to determine structural strength and mechanical advantage—the efficiency and hardness of the bats’ bite. Finally, they studied the engineering results across hundreds of evolutionary trees of the bats to uncover the three optimal snout shapes favored by natural selection. Selection favored the highest mechanical advantage in Short-faced bats, which gives them the high bite forces needed to pierce through the hardest figs. Nectar feeders have very low mechanical advantage—a trade-off for having long, narrow snouts that fit into the flowers in which they find nectar. 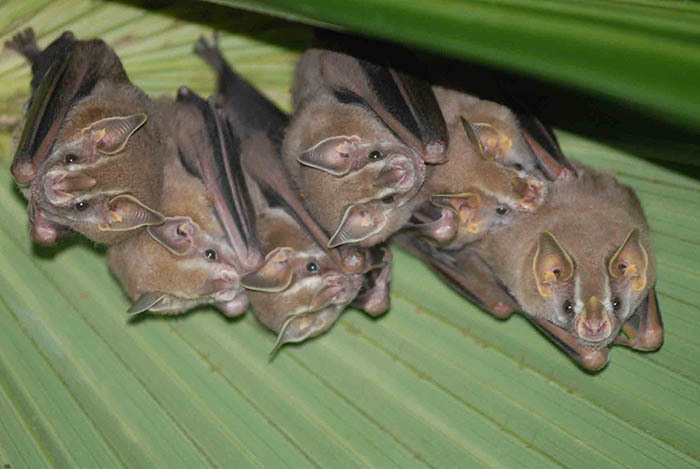 Morphological diversity among New World Leaf nosed bats with different diets. Nectar: A) Platalina genovensium, B) Glossophaga soricina; generalists: C) Carollia perspicillata, D) Vampyrum spectrum; fig-eating frugivores: E) Artibeus jamaicensis, F) Chiroderma villosum; and short- faced bats: G) Phyllops falcatus, H) Centurio senex. Crania are not shown to scale. By coupling a flexible engineering model with analyses based upon evolutionary trees, the study opens the possibility of discovering evidence for selection in other very diverse organisms, and of reconstructing skull shapes in long-extinct ancestral species. 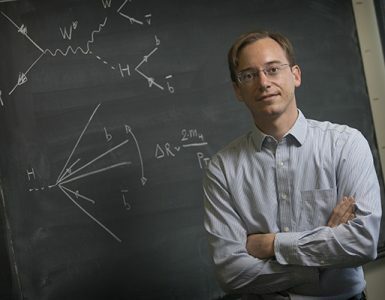 The researchers are now applying these models to uncover why certain forms that are feasible mechanically do not exist. 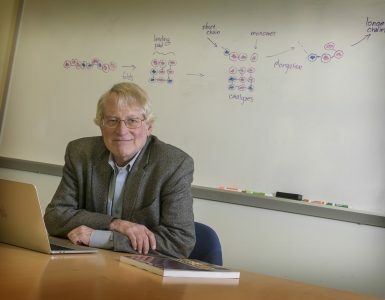 They are also applying new evolutionary models to find out if these limits may arise through natural selection that is not solely focused on the biomechanics. Distribution of hypothetical species based on snout length and width. 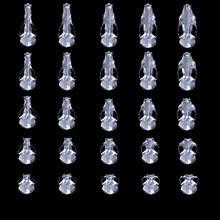 A single model was morphed to represent species within the entire space in order to calculate the engineering performance of different skull shapes.